I’ve been loving my morning walks in Dana Point. So much so that I’ve been skipping bootcamp. It that bad?! I say HECK NO! Being outside by the ocean in the early morning hours is super calming but also super energizing. It’s like the perfect way to enter into your day. I’ve been messing around with my eats lately. I’ve scaled back a bit on the amount of meat (red meat especially) and upped my veggie and veggie juice (no fruit juice!) consumption. Am I turning into a vegan hippie?! Definitely not. I sure do love to eat from the animal kingdom. To be honest, I just haven’t really been feeling like diving headfirst into burgers and bacon omlettes. Yes, they are delicious, but I think ultimately it’s more important to listen to your body and give it what it wants (within reason) not what you “think” you “should” be giving it. Taking the time to follow my intuition and not the dogma of any particular diet. Just because I eat Paleo, live Paleo, and work Paleo doesn’t mean that I have to constantly embrace my inner “hunter”. As you can see below I’m still clearly within the “paleo” framework with my meals. I just haven’t been finding it necessary to rifle meat down my throat 24/7. But if you want to, there’s a recipe here for some darn good meatballs. Have at it. pan-seared trout with skin on. It was a good day to eat! In a bowl, mix meatball ingredients until well combined. Form into 1 1/2 inch balls. Set aside. Using your vegetable peeler, peel your carrots into long “noodle” strands. Heat 2 Tbsp. oil in a skillet. Add carrot and saute until wilted but not soft. Set aside in a bowl. In the same skillet, drop meatballs and cook until brown on all sides. Add 1/2 of the curry sauce and let the meatballs continue to cook in the sauce until cooked through. Remove meatballs. Add the rest of the sauce to the skillet, scraping up any bits from the pan and heating the sauce throughout. 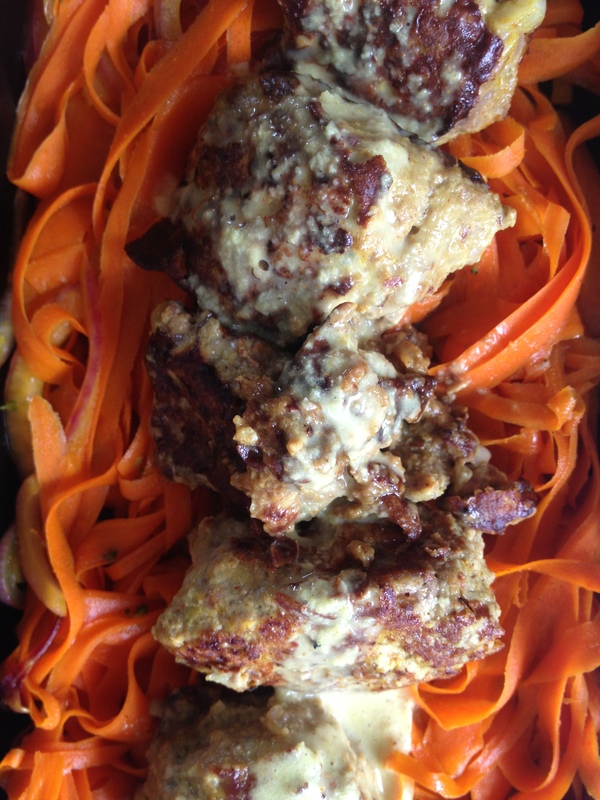 Serve meatballs over carrot noodles with sauce drizzled on top.